Are you ready? Are you being called? Reconnect with yourself, connect with other pilgrims from all over the world, clear your mind, be inspired. 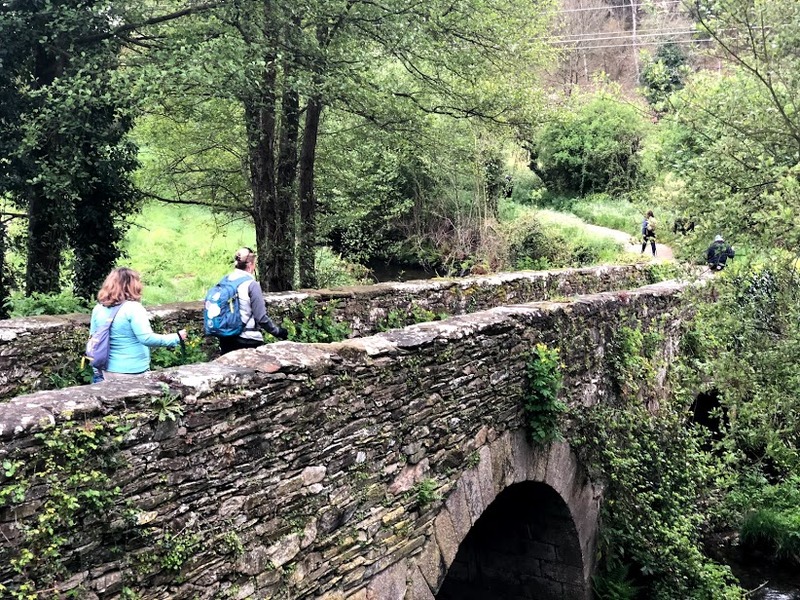 As we walk through villages, enjoy the local food, engage in conversation with the locals and be apart of this ancient journey, you will feel the power of the Camino. Join us as we travel this prayerful path…..The Way of St. James. This journey for the soul, which we will embark on, is the same journey that millions of pilgrims have walked before us. We will walk approximately 112 kms from beautiful Samos to Santiago de Compostela. Samos is a beautiful place to begin because of the Benedictine Monastery which is located there. Lets begin this journey with prayer and Mass if you wish. Along both routes we will enjoy this spiritual Camino, with its beautiful Galician culture in food and atmosphere. This is the northwestern route of the Camino Frances, the most popular of all the Camino routes. At the end of this walk you will receive your “Compostela, (El Camino Certificate, Pilgrims passport). 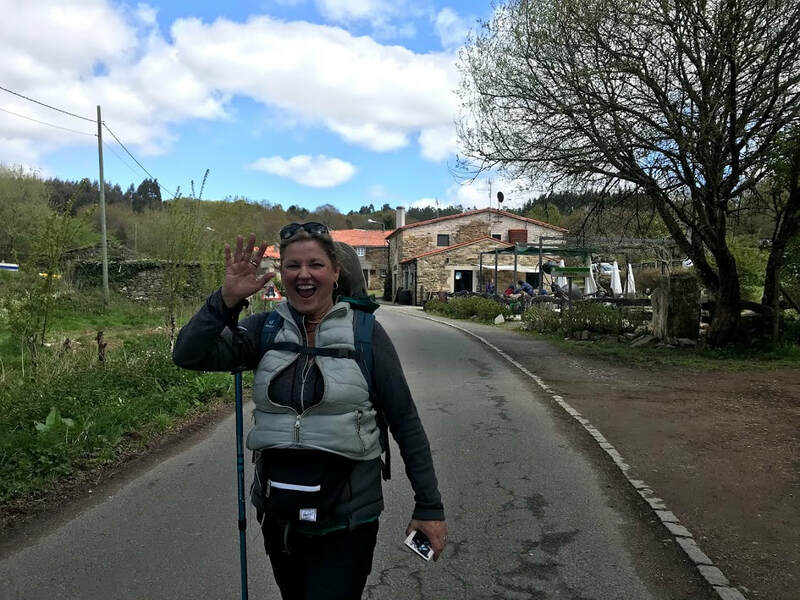 The Camino de Santiago is a life-changing experience for many and is always an adventure of a life time. Even within the retreat group, we encourage you to take the opportunity to be alone with yourself. The journey is yours to experience. Each of us on our own journey. 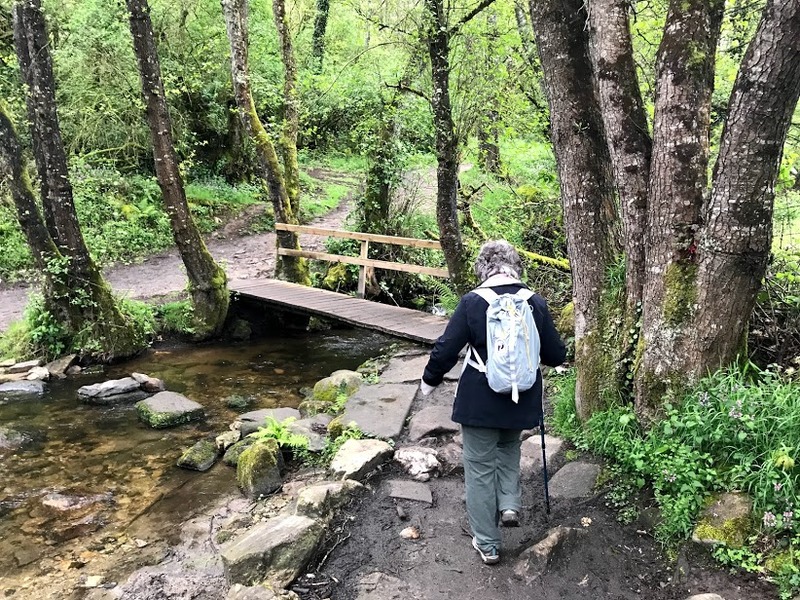 Part of the beauty of the Camino is walking no matter what, in the rain or the sun. 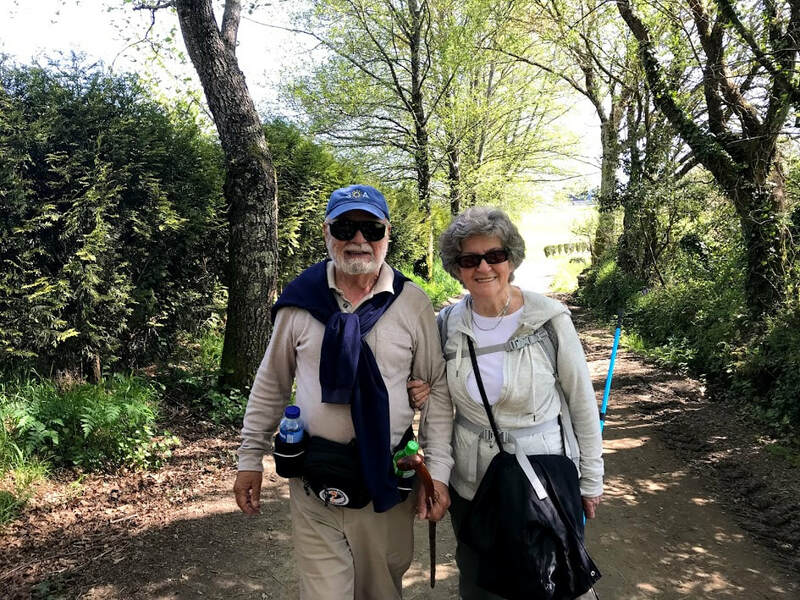 This allows us to experience the Camino, to take what is given to us and to endure and be thankful every step of the way. We begin our days with prayer time. Which then allows you to walk and reflect on your thoughts. Everyone walks at their own pace. You will find yourself having alone time amid lovely moments of laughter with your fellow pilgrims. In the evenings, we will gather and have a prayer together. And perhaps share a thought or two. This pilgrimage is also a retreat for your soul. Prayer, reflection and share time! Buen Camino! 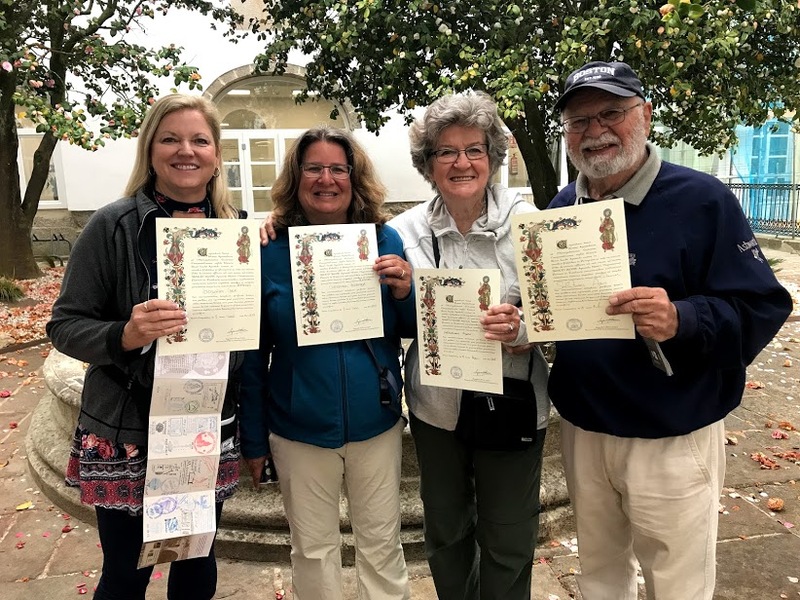 As you walk the Camino, you will be walking with people from all over the world. All will be heading to the same place. We want this pilgrimage to be your very own, to be a journey that enlightens and enriches your spirit. We are all simply fellow pilgrims. We strive to give you the pilgrimage you need, the pilgrimage that your soul is searching for. Charming villages with pretty churches. The outstanding local cuisine, the friendliness of the locals, and the rolling countryside all combine to create a truly unforgettable experience of rural Spain. 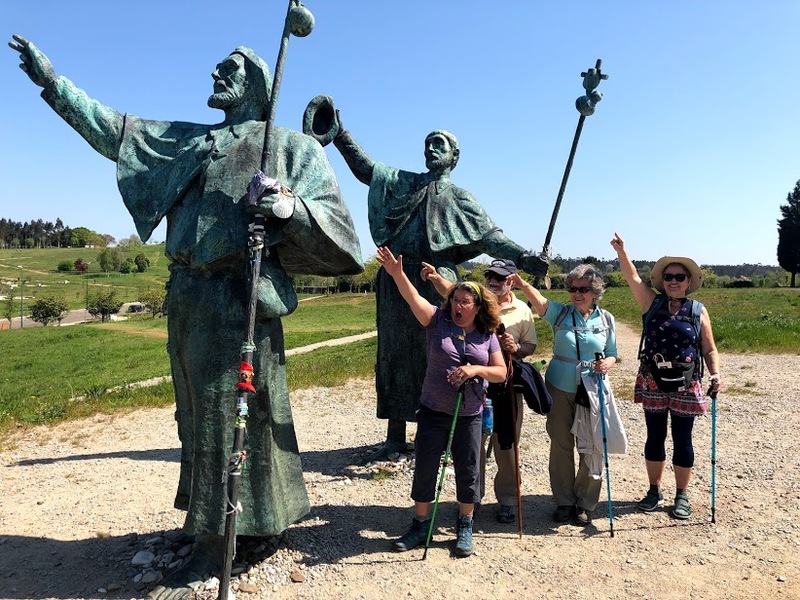 We strive to give you an affordable Camino tour. We hope you carry your pack and will help you in planning and packing before departure. But if you wish to carry only a day pack, we can arrange daily door to door baggage transfer for an extra charge. Relax no need to worry about details, we have that covered. All you need to do is walk! 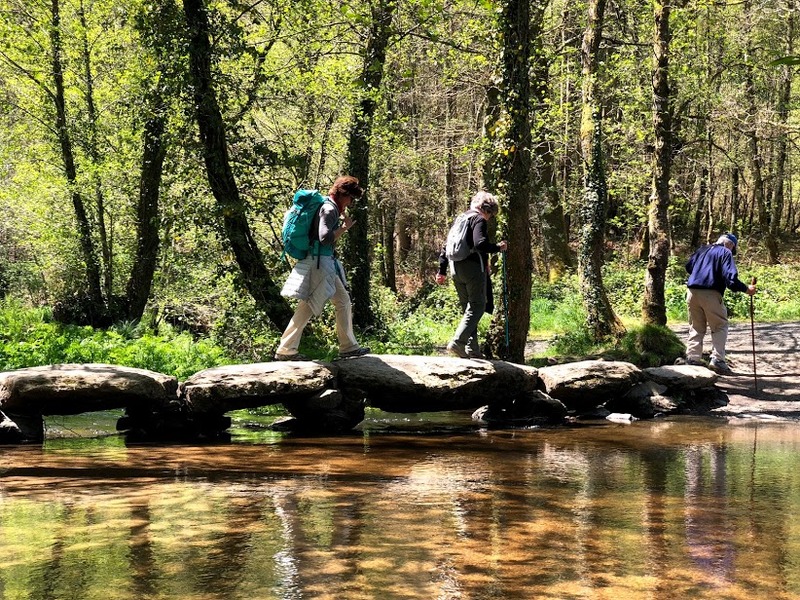 Walk Samos to Sarria, 8 miles. You may wish to revisit the monastery for morning prayers before we start our walk! We will have a few hours of lush beautiful rolling hills ahead of us. A nice short day. Once in Sarria, if you wish to attend Mass and have a pilgrim blessing we will check for times upon arrival. On this stage of our journey we will cross the 100 km mark to Santiago. 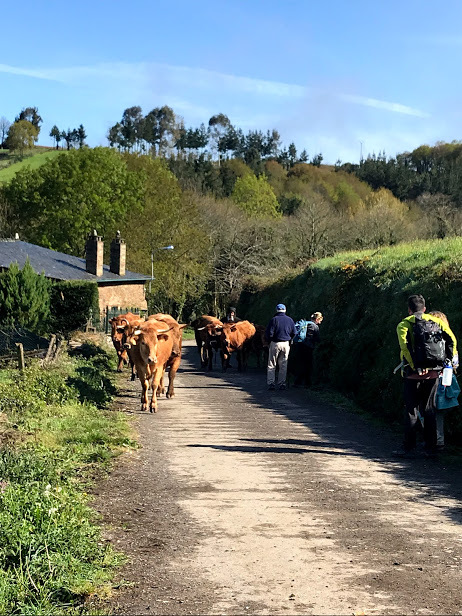 It is a beautiful walk with smooth hills which run through dense vegetation and passes through many small villages, typical of this part of Galicia. Portomarin dates back to the Roman Ages and was an important halt along the route in the Middle Ages. Due to the creation of a dam in 1962, the Old Portomarin is currently underneath the Mino River and many of the old buildings were moved. One of these buildings which was moved brick by brick was the Church of St. John of Jerusalem. This church was set along the route In Medieval Times, to protect the tomb of Santiago. We will journey on to Palas de Rei. This will be a nice walk through the rolling hills, villages and forests. A continuously hilly stage. This will be our longest day. We are still in the province of Lugo as we enter Melide. This is the town where the French (the busiest) and Primitivo (the oldest) routes meet, a crucial point along the Camino. Please make note of the old roads as we enter Melide. These roads date back to the fourteenth century, which are some of the oldest in the region of Galicia. Despite being inland, Melide's best dish and one you must try when here is 'Pulpo á Feira', boiled octopus. To enjoy this dish like a local it should be accompanied with bread, cachelos (boiled potatoes) and red wine. A nice stop for lunch for the day. Today we will enter the fragrant eucalyptus groves on natural pathways with good shade. We have breathtaking scenery as we walk largely on a level path with just 3 shallow river valleys. We end with a climb around the Alto de Santa Irene. As we enjoy our last night before entering Santiago, you will notice the joy and the energy surrounding the pilgrims! The pilgrims are excited and they all know tomorrow is the big day of entering Santiago. Though they have traveled a long distance, they are not tired and weary, the excitement and anticipation is overwhelming. Our Lord and St. James have guided their paths and the pilgrims share this joy with others. We will start before daylight today. The long awaited, final stage!! Only the uphill climb to Monte do Gozo presents any real resistance, and this feels a lot easier on the legs due to the fact that we are so close to the Santiago Cathedral. The entrance to the city along the road does not affect the mood of the pilgrim who has finally arrived to La Plaza del Obradoiro!! You may wish to attend the pilgrims Mass today in the evening. Botafumeiro could be used during this Mass. After we have rested in the Plaza, we will head to our resting place. This is your day, so follow your heart and your feet. Rest, Mass and dinner. You will awaken in the beautiful city of Santiago, breathe it in and relax. You have made it. Breakfast and then make our way for our tour to Finisterre. We will travel along the Costa da Morte on a full-day tour from Santiago de Compostela. Visit Cape Finisterre, go to the villages of Muros and Muxía, and see the waterfall in Ézaro. Along the way, learn about the history and culture of the Galician region. Back at 5 with time to have an evening exploring Santiago. Today will be the final chance to attend a pilgrims Mass at 12 and have a chance to see the Botafumeiro swing. You will have time to explore this beautiful city. Just make sure you enter the Cathedral and make your way to the tradition of hugging the shining statue of St. James. After the embrace, enter the crypt where Saint James relics are kept. Make sure you take some time and explore the Cathedral, it is formed with Galician granite. It is one of the finest architectural examples in Europe. It encompasses Romanesque, Gothic and Baroque styles. Tonight we will have our farewell dinner and have time to reflect on our pilgrimage. Pre-departure information including planning and packing suggestions. Nights in double rooms, single occupancy additional $200. Airfare to and from Europe. All flights need to fly into Madrid or Santiago. (We will give you all the information you need to make these arrangements correctly). 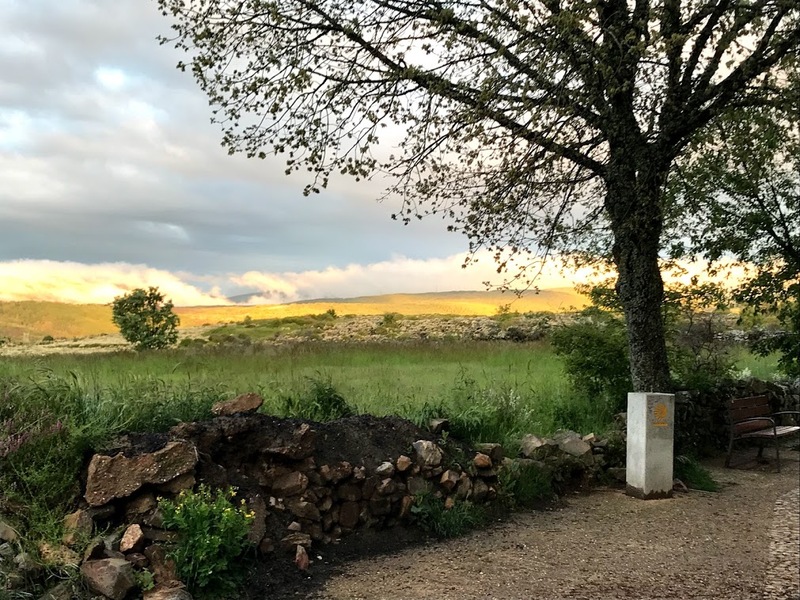 Where will we be staying along the Camino? All of our accommodations are carefully selected. We want you to experience the true Camino, for this reason we try to stay on the Camino or close to it. We try to provide charming and quaint rural farmhouses when available. These are similar to bed and breakfasts. Some nights we use hotels. These hotels are up to our standards and are quaint and locally run and owned. It is a good mix and you will be surrounded by fellow pilgrims along the Way! 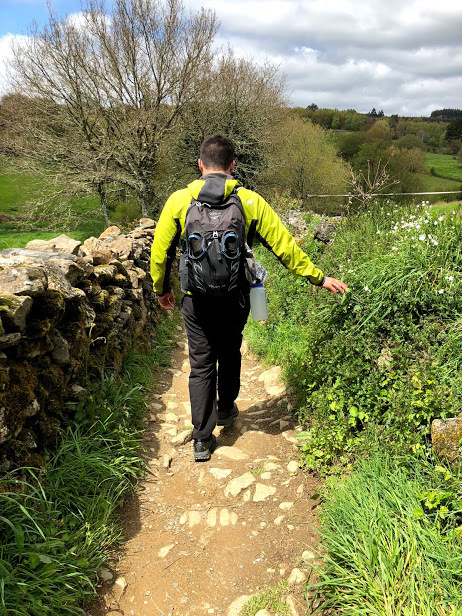 How do I prepare for the Camino? Preparing for a walk is the hardest part. First the mental preparation with all of its concerns and worries. Then the physical concerns, if you can walk any distance you can walk the Camino. After the mental is the prayerful side of preparation. Please pray about your decision, if you are meant to walk you will know it. In your heart, in your thoughts. You will feel the pull of The Camino! First step, please contact us so we can answer all your questions. We want to discuss all the details. We want to help answer all questions about transportation to and from the pilgrimage. All you need to do is walk, we will take care of the rest. This pilgrimage is fully guided, from beginning to end we will be there. No need to worry, we have you in our hands. All our guides started off as a pilgrim as well. 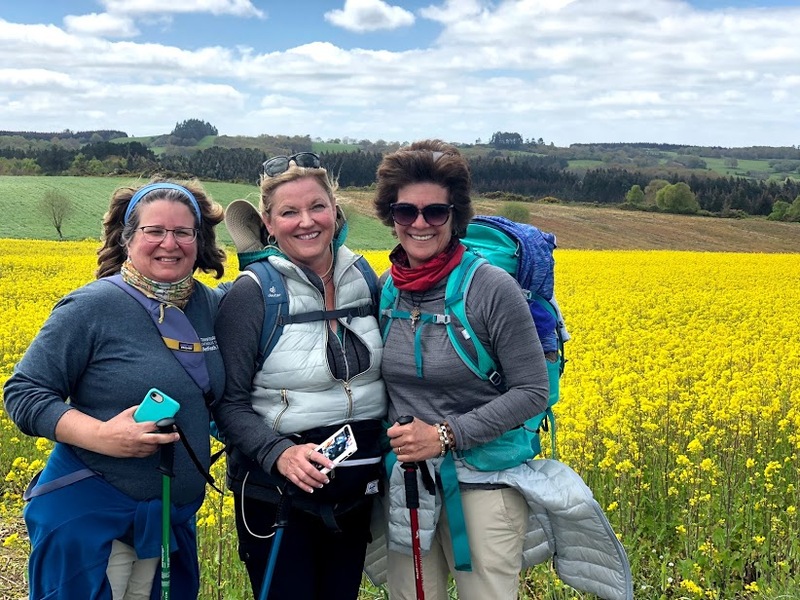 We have returned to the camino for years, to help others experience this amazing pilgrimage. We want to share this journey with others and we strive to give you an affordable amazing pilgrimage. Please visit our How fit do I need to be page for more information. Should I carry my pack or transfer it? This is completely up to you. Only you know your physical capability of carrying a pack. My only suggestion is if the reason you want to transfer is to have more clothing than you are missing an important part of the Camino. We should strip ourselves of the comforts of home so we may grow and learn. If health and age are your reason to transfer your bag then my suggestion is to transfer your bag but still pack light. Please check out our Trail info and packing tip page.